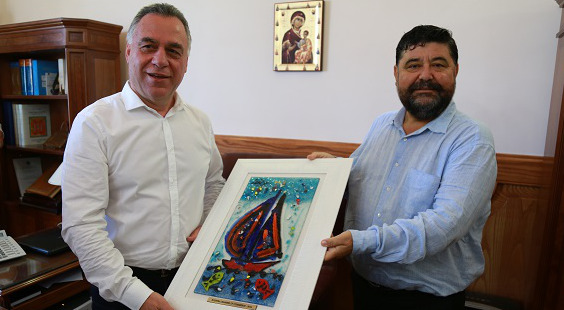 On Wednesday, 15th of June, Bodrum Mayor Mehmet Kocadon, Bodrum Deputy Mayor İsmail Altındağ, BODTO Chairman Mahmut Serdar Kocadon, BODTO Vice Chairman Mehmet Ayaz and Board Member Deniz Eyinç and Bodrum Tourism Representatives visited Kos Island Mayor George Kritsis in his office. From the Kos delegation, Kos Deputy Mayor in charge of tourism, Ilias Sifakis, Kos Port Chairman Sevastianos Maragos, Kos Deputy Mayor Mr. Efterpi Pachachristou, Kos Deputy Mayor Antonis Kritikos, Kos Municipality Parliament Speaker Nikolaos Milonas, Kos Municipality General Secretary Nikolaos Manousis and Kos Chamber of Commerce President Stefanos Gializis attended the meeting. During the visit of the Kos delegation to Bodrum on Friday, June 10th, the subject of " the establishment of a joint secretariat for the important contributions of the two regions to the economy and mutual work in the 2016 tourism season" was taken into consideration again for the real work.